You're about to buy your first electric guitar. You want to be smart about it. You do not want to look back in 15 years time and have a facepalm moment. Most of us veterans have done this. Wondered why we bought some totally inappropriate piece of gear when way better options were available. This guide is a no nonsense approach to avoiding that moment no matter what your interests or what direction guitar playing takes you. This is the best time there's ever been to buy a first guitar. In recent years a great number of guitars have been made that while modestly priced, are of top quality. Sometimes they save money by using cheaper components that can be swapped out as you go. Buying a guitar like this means that even if you get your schmancy Gibson in ten years, you will never need to get rid of your first guitar. It'll be a useful second guitar even if your band is touring the stadia of the world. The flip side to this approach is to go with bad guitars that look like good guitars. I'm talking about guitars that are made by one of the big manufacturers and trade on that name, rather than on quality. The Yamaha Pacifica 112. This guitar is superbly made. There was nothing close to this when I started playing. In 20 years time, having swapped out pickups and bridge and electronics, this guitar will still do whatever is asked of it. I'm very hesitant about talking about Cort guitars. While they offer amazing quality for price, their grotesque abuse of their Korean workers means I'd recommend other brands first. The Paul Reed Smith SE range. Amazing quality and fantastic looks. These guitars have their quality checked in the USA and as such, with a pickup change, are professional quality instruments going for very little. Made in Mexico Fenders. Forget Squiers. They're mostly rubbish. Rather save a bit extra and get a Mexican Fender. These are good guitars. 2nd hand they're going (at time of writing) for about R4,000. Again, a few upgrades and you can use it until they pry it from your cold, dead hands. Made in Japan Tokai copies of Fender and Gibson guitars. I love Tokai to the point that some people assume I have a financial relationship with them. I don't. They just offer such incredible bang for buck and quality that I can't get over it. Their copies give nothing away to the original Fenders and Gibsons. With luck, a second hand example will be well within a generous beginner's budget, as will some of the more affordable made-in-japan copies of Fender designs new. The trick is to get the best quality guitar you can afford before anything else. This is key. A high quality guitar allows you to learn without hindrance, and will not require replacement when the time comes to gig. You may get rid of it because you need the money for something, or because it's not the style for you. But you shouldn't need another guitar, as so many of us have needed one, because the first one isn't up to snuff. You don't need an amplifier to learn, and you certainly don't need effects units. You need a good guitar. Spend everything on the guitar, and save up for the amplifier later, or buy the crappiest little amp just to be able to hear yourself for R350 2nd hand. Second hand is always better with guitars because, (a) after the initial hit taking them out of the stores they don't really depreciate - which means if you buy second hand, you can sell for as much as you bought it for. (b) you can get higher quality instruments for the same money. Always get an experienced guitar player to check the guitar with you and see if it needs to be set up by a technician. This set up is a small expense that can make many practically unplayable guitars play like a dream. Once you have the guitar and you are able to spend again, it's time to get an amplifier. Now I'm going to suggest something very different from what many people, including the sales people will suggest. Get a valve amplifier. Valve amplifiers (also called tube amplifiers) are the absolute gold standard for guitar tone quality. They are not high-fi and it's what gives electric guitars their distinctive sound - including the lush warm distortion we're used to hearing. All the non valve options seek to emulate this sound. Now it was true for a long time that valve amplifiers were expensive and/or ludicrously loud. But, as I mentioned, we are now living in a golden age. You have the opportunity to start with a phenomenal sounding valve amplifier. Forget the "modelling" amps with built in effects. They will become obsolete with new technology, you'll want to replace them and find out at the same time that their value has plummeted. They will also never give you that gold standard tone. Rather develop your ear for a good amplifier sound with your first amp which you will have no reason to ever get rid of even if you get a bigger one, or one optimised for playing in a particular style. To be more specific, get a Laney Cub12R. This amplifier is all valve, cheap as old boots, and I've heard it deliver classic guitar tone with massive response to picking (gets more distorted the harder you pick or when you turn the guitar volume up) in live settings played by players you could only wish to be. It's a joke that these things are so cheap. They sound amazing. There are other cheap valve amps now, but none that I've heard sound as good as the cub. Seriously, it sounds better, even with the stock speaker, than many R15,000 plus amplifiers I've heard people use live. If I didn't have the opportunity to get one of the few amps I know that does sound better (at a much higher cost), I'd get one myself. They're also only 15 Watts - that's frankly unbearably loud in your bedroom at full blast, and loud enough for many small club gigs (at bigger venues they put a microphone in front of the amplifier anyway). A bigger amp is so loud that you can't get a certain kind of classic distortion out of it: power tube distortion. Distortion can happen either in the initial part of an amplifier - the pre amp - or at the point where the amplifier drives the loudspeaker - the power section. Most guitarists have never heard power amp distortion except on classic records. This is because they, unlike the players of yor, can't run their huge 50W or 100Watt tube amps loud enough. Ever. Pre-amp distortion sounds very different. With a little 15W amp, you can learn to use both. You can also learn to control distortion from your guitars volume controls - again, something that guitar players from the '60s and '70s knew about which virtually no modern players do. Even if you choose do do things differently, you'll have learned this amazing skill. There is a version with a 10 inch loudspeaker, the Laney cub10. Don't get that one. 10" speakers are fine if you have a bunch of them. But a single one will not be heard in a club gig. 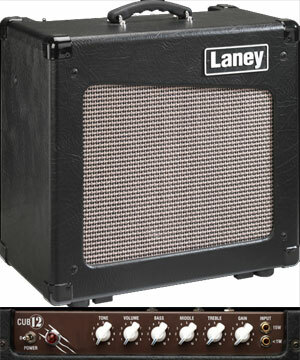 You may also find Laney Cub12s without the reverb (the R in the Laney Cub12R). Reverb creates a spaciness (like how sounds are in the bathroom, big cathedral, or cave) which is really great to have built into your amp. But its not a deal breaker if it doesn't have it. In fact, reverb, like all effects can hide whether you're playing badly and inhibit your learning. This is the only box you absolutely must have between your guitar and the amplifier. The box that convinced me that a tuner could be fun ( O_o ) was the Korg Pitchblack tuner. It's also cheap as chips. Actually they're a huge distraction from learning guitar and should only be used by people who can already play. But I'm not going to convince you of that. What I'll say is this. Multi effects units, like modelling amps, depreciate to paperweights at lightning speed. Do not spend money on a multi fx unit unless you really know what you're doing (ie, you should probably be a pro or regularly gigging musician to justify doing this). 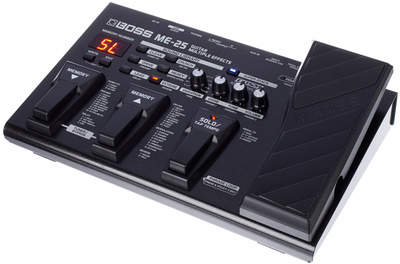 Since you'll want to learn about effects, get a cheap, obsolete unit like a 2nd hand Boss ME25 or one of the ghastly Zoom units. These are easily good enough to learn about the effects without you having wasted your money when your fancy unit hits R0.00 before you even have enough experience to use effects effectively ( ) or to tell a good effect from a bad one. Note, if you're a metal player, you're going to want to find a great metal stomp box to get that kind of tone from the amp I've suggested. Don't rush for the most famous unit (the Boss Metalzone) listen and try various other options. Many are better. A metal distortion unit running into the cub12 will still sound better for metal than they usual beginners options of modelling amps and other rubbish - even if you ultimately must have a Mesa Boogie Triple Rectifier (around R30,000 I think) when your band, Children of Yog Sothoth, goes on tour. Don't use a sharkfin. Ever. They are an abomination. A blasphemy against God and nature. It makes experienced guitar players want to slit their wrists to see beginners struggling with these horrors. Use a reasonably stiff pick (usually around 1mm thick) which gives you more control - even for strumming - of the size and material you prefer. Many players find as they get more skilled they prefer smaller picks. 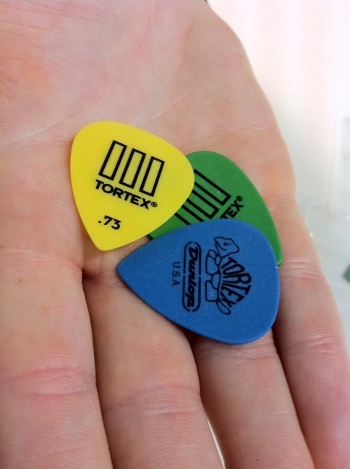 I'd recommend starting off with a small pick like the Dunlop Jazz IIIs available in a variety of materials. This basic set up - great guitar -> great tuner -> great amplifier can be further improved with some simple mods. The most important improvement you can make is to change the loudspeaker on the amplifier. The Cub12 may be a great amp, but they do take some shortcuts to get it so cheap. One is to use a very cheap loudspeaker. After the amp itself, the loudspeaker has the greatest effect on the final sound - more than the guitar, the pickups or anything. To take the amp from great to amazing, replace the speaker with a Celestion G12H30, if you want more volume, or you want a punchier, more modern rock sound, or a Celestion G12M "Greenback" if you want the amp quieter or you want a more classic rock sound. Do not put a Celestion Vintage30 in the cub (a very popular loudspeaker) because it will be too bright and cutting. After this, you can replace the guitar's pickups. Cheap guitars use cheap pickups. Change them for the still affordable, but much better tonerider pickups. Do the change yourself. Part of the advantage of a cheaper instrument is that you don't need to fear mucking it up which puts us off doing our own mods even though they ultimately prove to be very easy. Get started on this now. At this point you have a rig that most famous guitar players would be more than satisfied with if they were handed it on stage. It will sound approximately a gazzillion times better than other beginners rigs and you will still have all this stuff in 40 years time while other gear has come and gone. A final note: This advice will mean you will have an amazing sounding rig to learn on that is good enough for professional playing. It does not mean that this alone will satisfy everything you want to do with your guitar playing. People end up wanting a specific guitar (usually based on looks if we're honest with ourselves) for a specific purpose. Or an amplifier with an effects loop to get the best out of effects. Or it winds up suiting you more not to use an amplifier at all. That's all fine and well. However, all of those things take a lot of experience. While learning it's best to have an affordable rig that sounds amazing no matter what, and that will always be a versatile option for taking to jams, playing at home, or learning new styles of playing, no matter how far you go. I was hung over and over-caffeinated. Well, I thought it was worth writing because I figure 1 in 10 or so actually will think it's worth trusting the old hands rather than following the usual road of mishaps. Maybe the odd dad of a 14 year old will also be influenced when they're part of the process. Absolutely. At the very least, everyone reading this won't be able to say they were in the dark. I agree with pretty much all of it, few other amps to try out, the Ibanez TS amp, one in the classifieds now for R2500. Marshall Class 5 (even though Singe doesnt like 10" speakers) but it does do Marshall plexi type noise in a bedroom package.. (and is actually loud enough to gig with). nick wrote: I agree with pretty much all of it, few other amps to try out, the Ibanez TS amp, one in the classifieds now for R2500. Marshall Class 5 (even though Singe doesnt like 10" speakers) but it does do Marshall plexi type noise in a bedroom package.. (and is actually loud enough to gig with). No. You don't pick up a Class 5 easily, let alone for Cub prices. Singe's point is not to give people 10 other options that are so-so, just one or two that are best. What does a Cub12 cost new? I bought a Class5 new with discount for R3600 odd, are they really significantly cheaper than that? Alan Ratcliffe wrote: Great post Singe. Stickied. Mexican Fender Strat with a Laney Cub 12 with a TS-808 OD pedal. That would've been an awesome first rig. Dude, this is masterful Masters avoidance behaviour. And excellent to boot... thanked on behalf the lucky neophytes. :roflmao: THANK YOU. This point alone makes this thread one worth sharing with some guys I know. Great article though. I wish I knew the difference a 12" speaker makes when I got my Laney. The little 10 it has is probably the only thing wrong with my rig Still at the few band practices I've had it blew the 50-80W solid state nonsense away. Suits me plenty for what is almost exclusively home use at the moment. And I've bookmarked this to send to anyone I know who's interested in taking up electric guitar. Glad you guys think this is generally sound advice. Hopefully I can update it in the future to include other appropriate stuff that becomes available or that I've overlooked. Currently I still think the cub12 is a much better sounding amp than its valve competitors (I think I've heard all the main ones, including a few of them in live gigs) at the price range; punching far above its weight. Another guitar option in the lowish budget range might also be Hamer. I've only handled a few, but some seem very well made. singemonkey wrote: Glad you guys think this is generally sound advice. Hopefully I can update it in the future to include other appropriate stuff that becomes available or that I've overlooked. The few I've seen are quite nice looking too. Yeah, what do they go for? Just one question about the Laney. How does it sound when you are playing at at low volumes? I am talking from a practicing at home point of view, or would an amp modeler be a better bet for home use?